Here is another card I made for James when he is in boot camp. I think I will send this one in the last week before he leaves for his AIT (Advanced Individual Training) at Fort Eustes in Virginia. He really will be gearing up for the second half of his training. James will be training to become a Chinook Helicopter mechanic and his AIT will last 19 weeks! There will be a lot of class time to go along with his hands on training. Hopefully he will find it to be interesting work. I will be playing along with the CAS-ual Friday Challenge: Over the Edge with this card. In order to make sure that the card will still fit in a traditional A2 envelope I cut down the width of the card first and the applied the gear over the edge. 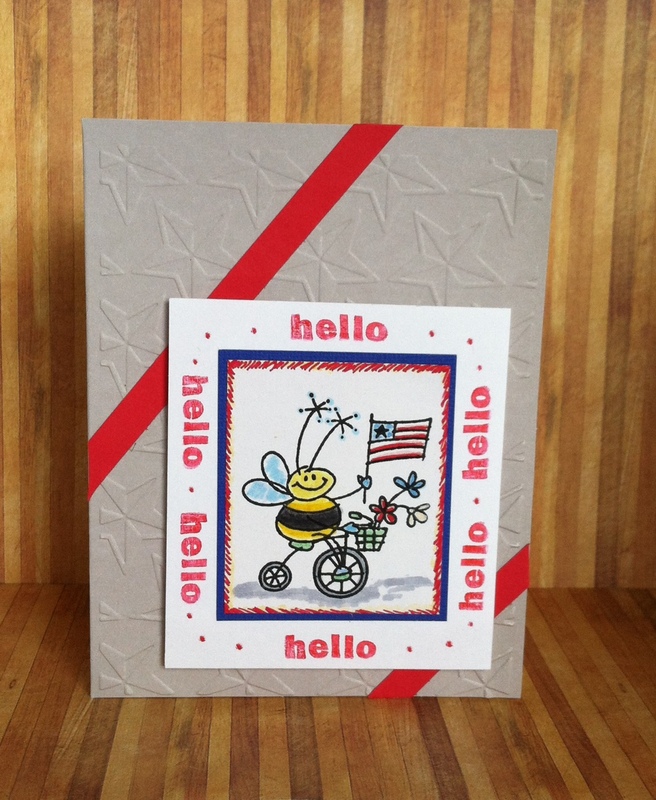 This card is just a fun whimsical card to say “Hello” and let James know that we are thinking about him. This card is based on a sketch featured today on one of Operation Write Home’s blogs. The example card had patriotic colors and I figured I would run with that since I was creating cards for my future soldier. Posted in Any Occasion, Masculine Cards, Patriotic Cards and tagged 4th of July, cards for boys, cards for men, fourth of july card, masculine cards, Patriotic cards, red, white and blue. Bookmark the permalink. Nice cards. The last onr really pops! The stripes are brilliant. Tfs!!! These are fabulous cards- love your patriotic card for Sunday’s sketch! And thanks to James and to his fabulous parents- military service is a huge sacrifice on the whole family- and it is very appreciated! great cards … love your take on the OWH sketch. Thanks to your son for serving our country. My son went to Fort Eustes for AIT, too. He’s a mechanic for the Apache. Gorgeous cards! Thank you to your son for his service to our country! This is a great take of OWH sketch! I love the patriotic look! This is a great take on OWH sketch! I love the patriotic look! I can see why you are so proud of your son! You have made a great group of cards to encourage him during his training! I really like how you flipped the sketch! 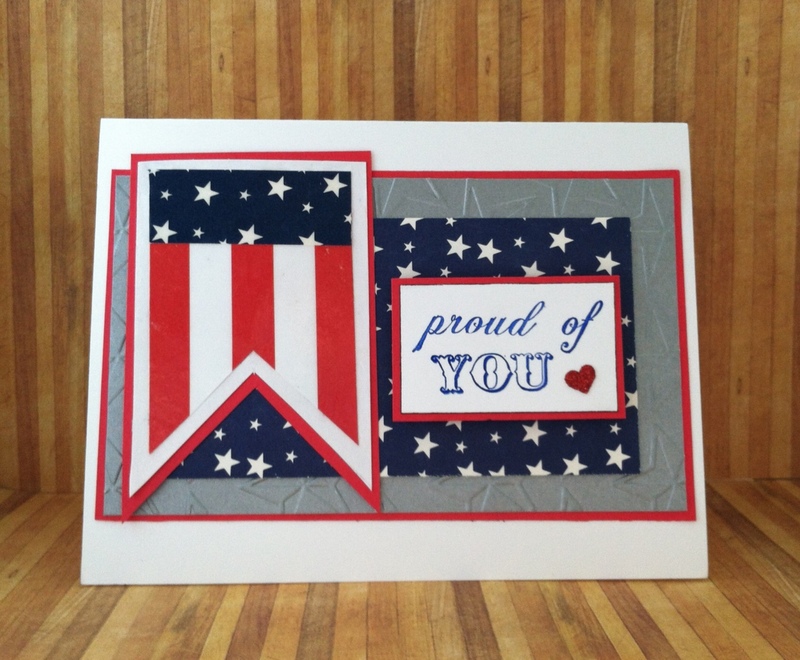 Love your patriotic card and I bet your son really appreciates it! Wow I’m amazed at your fussy cutting for the first card! Thanks for joining us at CAS-ual Fridays Challenge! very cool first card, perfect for a boy! wonderful work! thanks so much for joining us this week at CAS-ual Fridays Challenge! 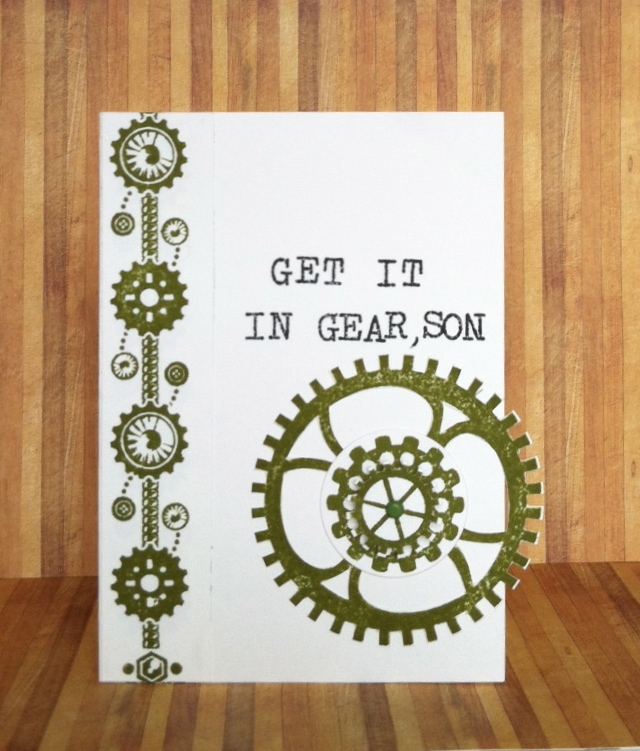 These are great cards, and I’m sure your son will appreciate the notes from home. 🙂 The sentiment on the first card is perfect for him, and I love the overhanging gear. Thanks for joining us at CAS-ual Fridays!